Late 2017 Intel released their 8th generation mainstream processor series code-named the Coffee Lake chips. While the initial release was rushed out due to a step up in competition from AMD, the actual availability of the new processors has been patchy at best. We have managed to secure a stock of these chips and here are our benchmark results comparing the performance differences between them, as ever, with a view to how they will actually affect your trading computer performance. All of the following tests have been carried out on the same hardware with only the processor being swapped between each set of tests. The computer spec follows on from our previous Kaby Lake test, simply updated with the new Z370 chipset motherboard which is required by the Coffee Lake chips. Full test computer specification: Asus Z370-P Motherboard, 16GB 2,666Mhz Crucial RAM, 240GB Kingston Solid State Hard Drive, nVidia GT1030 2GB Graphics Card, BeQuiet 600w Power Supply, Antec 302 Case, Arctic Freezer CPU Cooler. In terms of software we used: Windows 10 Home Edition, Google Chrome v59, Handbrake 1.07 (64-Bit). Each of the following tests were performed three times with the average of the three results given as the reported score. Our first series of tests are web browser tests. They are a series of benchmark tests that run inside the Google Chrome web browser and give a final score. Tasks that are tested are typical things that a modern web application would do in standard day to day operation. This is a great proxy for how many web based trading platforms will actually perform as they are essentially web applications run in a browser. These tests are also a good measure for how many standalone trading platforms would work as they often perform similar types of tasks as their web based counterparts. 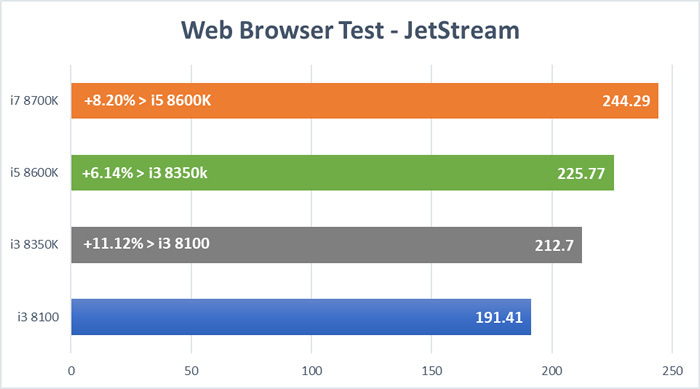 JetStream is a test which simulates the many types of background calculations that a typical web application would run making it a great measure of overall web app performance on a PC. Moving from the i3 8100 to the i3 8350K gives a pretty good jump in performance, the i5 pushes this a bit further with the i7 coming out on top here as you might expect. 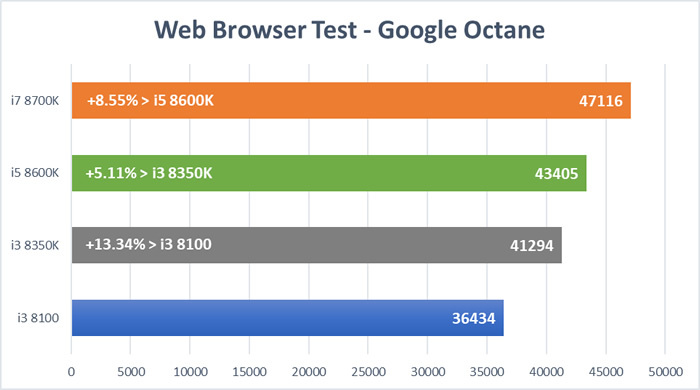 Similar to JetStream, the Google Octane test produces a score based on typical web application performance levels. A very similar result is found here with the jump from the i3 8100 to the i3 8350K giving the biggest performance increase, the i5 8600K moves another 5% infront and the i7 dominates again. The final browser test is the WebXPRT tool, this is slightly different to the JetStream and Octane tests in that it measures more graphical type functionality, for example picture resizing and chart / graph manipulations (a great proxy for what a trading tool might do). 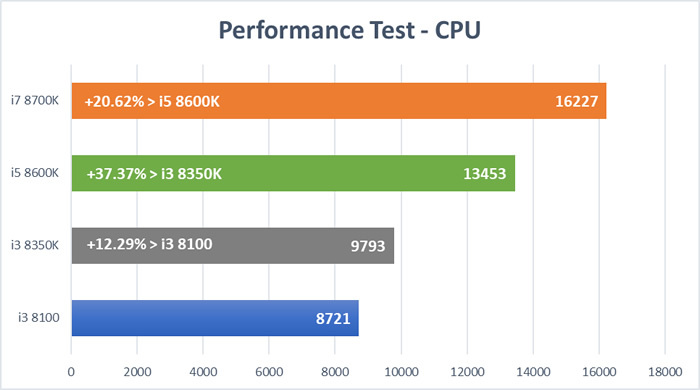 Here the differences between the processors is similar to be for but less pronounced, spending more money on the faster i5 or i7 gives better performance but not quite as much as reported by the other browser based tests. Looking at how a processor performs in a test with just one web application running is useful, however we also need to know how well they might handle different types of workloads. For the following tests we mainly use the Passmark Performance Test suite of tools which measure a variety of system benchmarks, we also have one encoding test measured by Handbrake, more details of this can be found below. First of all let’s look at the overall score determined for the CPU by the Passmark suite. 9 different sub tests which measure things like physics simulations and sorting algorithms contribute to this score, we will explore some of these sub tests in more detail later. Whilst the overall trend matches what the browser tests showed, what is interesting is the fairly major performance jump from the i3’s up to the i5 by over 37%. The top end i7 boosts this by another 20% which again is a significant increase, let’s dig further into this to see what (if anything) in particular contributes to these gains. Technically a single thread CPU test measures the absolute speed that a processor can process 1 set of instructions at a time. It ignores multi-tasking performance completely. Due to the fact that most software doesn’t really take advantage of some of the mutli-tasking benefits of certain CPU’s, the single threaded CPU test is seen by some as a more ‘real-world’ measure of the speed differences between processors. 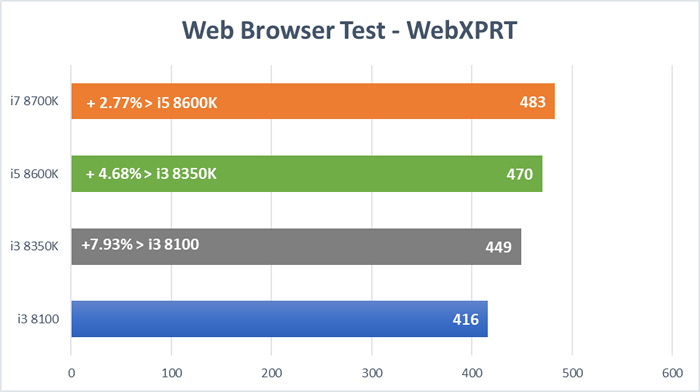 Looking at the results shows us that this test more closely mirrors the web browser tests above, each step up gives a decent (but not startling) bump, but that this reduces slightly the higher up the CPU chain you get. The fact that the performance jumps are so close to the web browser tests seems to back up the point that this is a good measure of performance for a typical trading / charting application running through a web browser. 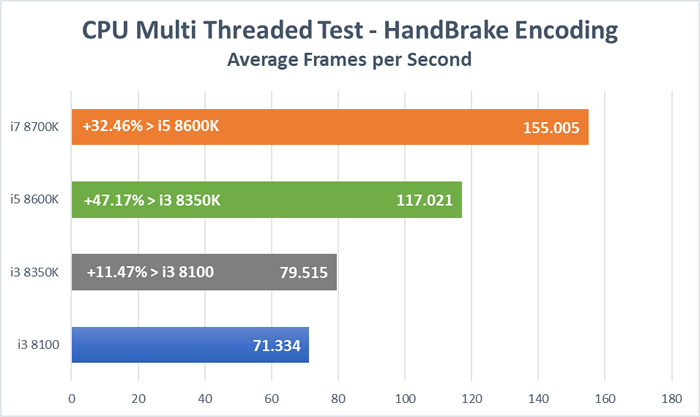 Here is our multi-threaded benchmark computed by using the Handbrake video encoding software. Converting one video format into another is a really intensive task for a CPU to perform, the Handbrake software will take advantage of extra CPU cores to help speed up processing, so if we measure how long it takes to complete a video conversion job on all of our processors then we end up with a reliable indicator of how well a CPU can handle these types of intensive workloads. Measuring multi-tasking performance is important, on a trading PC you might be running 2 or 3 different trading platforms or charting packages, on top of this you have your supporting software such as Windows, virus and security suites, spreadsheets, email, general internet browsers, netflix (well some of you do), multi-tasking performance helps keep everything running simultaneously without encountering any slow downs. Getting to the Handbrake test results shows again a big performance jump from the pair of i3’s to the i5. This is in part due to the fact that the i5 8600K (and the i7 8700K) have 6 processing cores as opposed to the 4 on the i3’s. This 50% jump in core count is matched by an almost 50% jump in the benchmark result. The i7 chip also has some tech called Hyper-Threading on it, without getting too technical here, it basically makes more efficient use of the CPU cores, this is contributing to the 32% jump over the i5 score. This is the last of our CPU only tests. Looking at everything it is easy to say that the i7 is the fastest and most powerful all round chip, of course it is but it is also the most expensive chip as well. If you want the best and the cost is within your budget then definitely go for it. What I also think is highlighted well here is that the i5 will also be a very strong contender for many trading systems. It offers a genuine performance boost over the i3’s, especially in the multi-tasking workloads. Your processor is responsible for calculating the input and outputs of your programs and your graphics card is responsible for displaying the output of your system to your monitor(‘s). 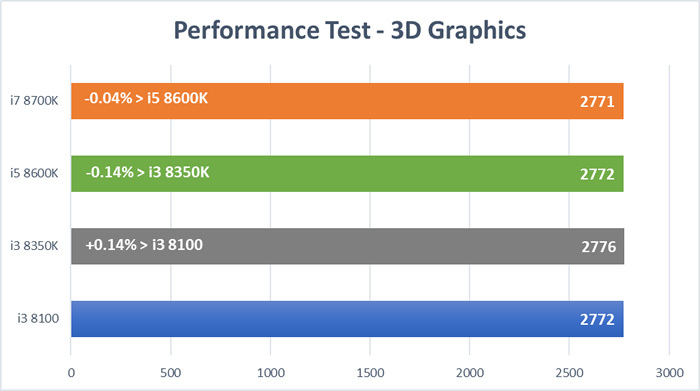 Do the different processors impact 2D and 3D graphical benchmark tests at all? Let’s find out, and remember that the graphics card used in all of the tests below is identical. 2D graphical performance is the most important graphics test for a trading computer. When viewing charts these are constructed from 2D shapes and vectors, and numerical data and standard program interfaces are comprised of fonts and simple shapes which again are all processed by the 2D engine on your graphics card. 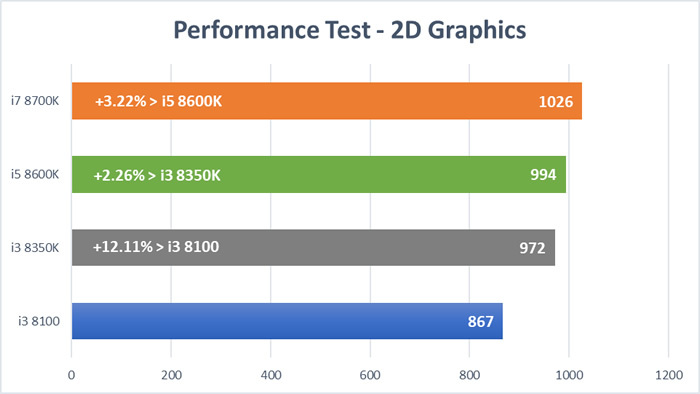 In theory there should be no difference between these test results if the graphics card is solely responsible for powering these tests, but instead, we see that the faster processors seem to impact your 2D performance somehow. We also saw a similar result in a prior Kaby Lake Benchmark Test, the i7 chip there outperformed the i3 and i5 chips. It’s difficult to explain exactly why this is, it could be due to instructions being passed to and from the graphics chips faster, or just a faster overall system helps with these test results. It’s worth noting that there’s not a massive impact on performance between the CPUs, but there is a definite advantage with the higher end processors. The Passmark suite uses a 3D programming interface called DirectX to assess 3D performance. DirectX is used by computer game programmers to interface with different types of graphics cards. If you have a gaming machine than this would be the most important graphical test to judge system performance, but for trading and more professional ‘desktop type’ software, 3D performance has next to no impact on how fast your computer will run. The chart shows that there is no impact between the processors here, this backs up the idea that the graphics card handles the entire workload by itself and it’s separate from the overall system performance. There are two types of storage on a PC, long term via a hard drive, and short term via RAM. The impact of a processor change on the performance of both are below. Open programs or files are stored in your computers RAM, the speed of accessing RAM and retrieving / updating data does impact on the overall speed of your system. There are 2 main steps here, going from the i3 8100 to the 8350K gives a nice 7.5% performance jump, moving on to the i5 has less impact at just 2.75%. Again the i7 wins in this test with an almost 5.5% jump over the i5, interestingly this also equates to a 16.5% jump over the i3 8100, that is a big difference when we are just talking about accessing your data stored in RAM. Your hard drive is long term storage, it is where your data files and all the system files required to make Windows and your programs run live. When you open a program your computer reads these system files and puts them into your RAM, so a faster hard drive can impact how quickly programs open which in turn can make your computer feel more responsive and fast. Once a program has been opened and is running then the hard drive will be less frequently called into action which means the speed of it has little impact on how your computer will perform for you. There isn’t really a significant difference between the hard drive benchmarks across the i3 8350K, the i5 8600K and the i7 8700K. They all outperform the i3 8100 CPU a little bit but again not by a lot. Overall I’d say there is nothing really to get excited about here, especially since this has little real-world impact on your systems operating performance levels. 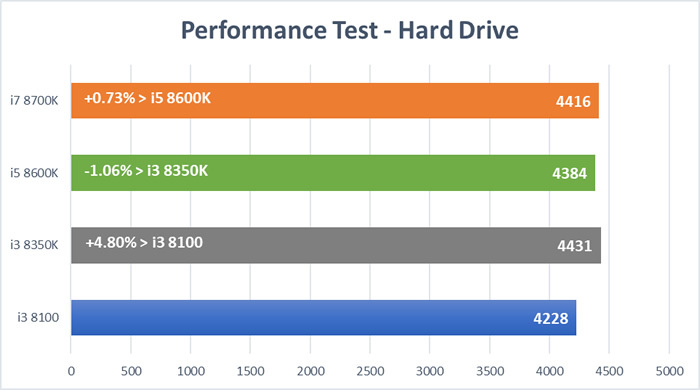 The Passmark testing suite takes all the CPU, RAM, hard drive and graphics tests into account to give an overall system score, let’s see what it says about our 4 processors. 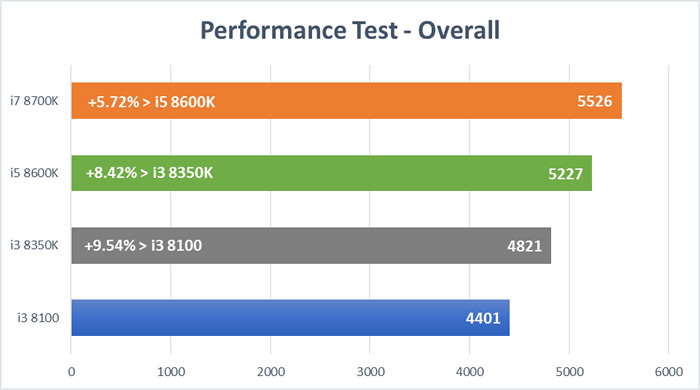 In a result which is not surprising based on the tests above, Passmark is giving the i3 8350K a 9.5% overall system boost over the 8100 CPU, similar to the web browser, single and multi-threaded CPU tests. I feel this is actually pretty good, an 8350K CPU will end up costing you around £70 more than the 8100, so £70 for an almost 10% boost in performance seems like a good deal to me. 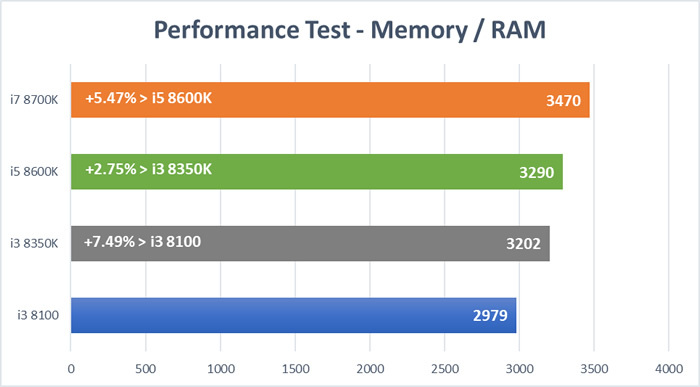 Moving up to the i5 gives us another 8.5% jump over the 8350K or 18% over the 8100 processor. Again, I think this is good really, the i5 will cost just over £100 more than the 8350K, so whilst it’s not quite as much ‘bang for your buck’ as the 8350K over the 8100, it’s not so far away either. The i7 is a clear winner in every single test and that is reflected by this score here. Is it worth paying a £100 premium on top of the i5 for just a 5.7% performance boost? Maybe, maybe not, it’s a personal and budget choice really. 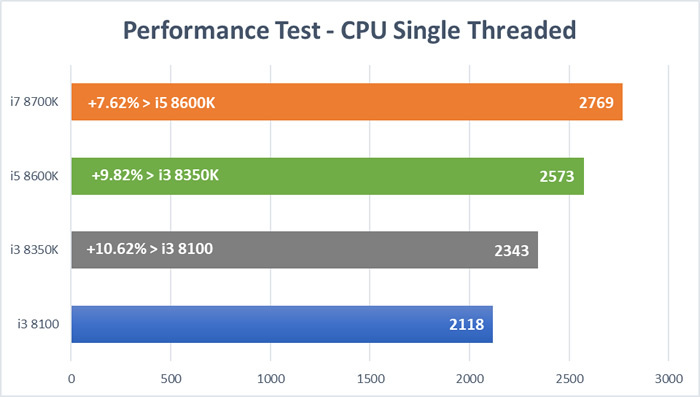 For more simple charting requirements and fairly lightweight usage scenarios then the i3 8100 is a good, lower cost option, it performs well in the single threaded CPU and browser tests, where it loses out more is in more multi-tasking type workloads. If budget permits, jumping up to the 8350K gives a significant enough jump to justify the extra cost in my opinion. If you’re running a couple of trading platforms alongside some standard desktop programs then the i3 8350K as a minimum makes sense here, going up to the i5 will give your system a bigger advantage when handling multi-tasking work as well as boosting it’s raw speed. Finally, for power users looking to do a lot of backtesting, or someone looking for the absolute best in performance then the i7 8700K is a phenomenal chip, it beats everything else pretty easily in all tests and the multi-tasking performance is really strong, it’s hard to look past it really. So, well done, you’ve reached the end of this Intel Coffee Lake CPU benchmarking test, hopefully it was of some use? If you still have questions or think we may have missed something out then feel free to let me know, I’ll look forward to hearing back from you.